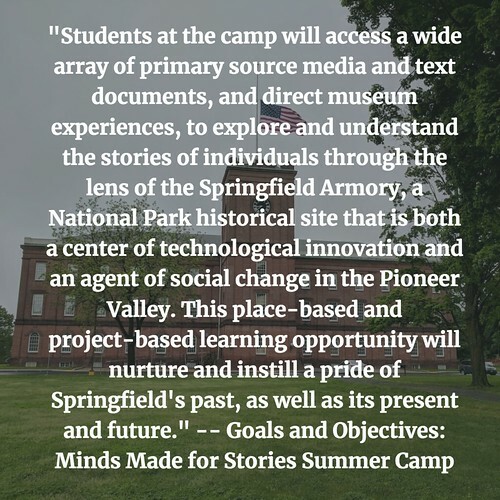 I am in the second year of facilitating a free summer camp for inner city middle school students at our local National Historic Site — the Springfield Armory. This project is funded through Mass Humanities foundation, with support from the National Park Service and the National Writing Project. Our Western Massachusetts Writing Project, of which I am a member, is the lead organization, but there are all sorts of interesting partnerships that have emerged from this adventure. Our partner school — Duggan Middle Academy — is a social justice-themed expeditionary magnet school in Springfield, Massachusetts. This weekend, I worked with the other teachers to complete the design of our free summer camp, which takes place at the Armory itself. Our theme this year is the World War Two Homefront, and we will be tackling issues of women in the workforce and segregation of the military (Double V) and innovation and technology at the Armory. We’ve worked on a mission statement to guide our design, and I think it does a nice job of capturing what we are planning, which is an immersive, hands-on experience with history, told through the stories that will emerge from the vast archives of primary sources available at the Springfield Armory. This statement guides our planning work.